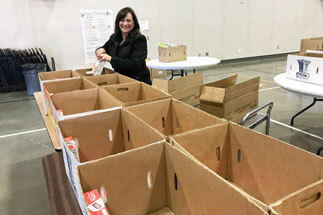 Brenda Higgins, EDCOE Food Service Supervisor, helped to fill 100 boxes full of food for families in need. One of the remarkable things about El Dorado County is our capacity to work together for those in need. Every year, community groups from different sectors take time out of their busy holiday schedules to provide food to families who need it most. This December, 100 families with children in the El Dorado County Office of Education’s (EDCOE’s) Child Development programs, received large boxes filled with enough food for a holiday feast and plenty of leftovers. “Thank you to the county agencies, businesses, volunteers, and EDCOE Child Development team members for making this program possible for our families,” County Superintendent of Schools, Dr. Ed Manansala, expressed. Money raised at the auction, along with additional donated funds, was used to purchase pallets of food. Then, the EDCOE Child Development Program team along with the ‘Don Andrews Lunch Bunch’ volunteer group, sorted food into large boxes for the families. This group of friends has donated time and their own funds over the last 30 years because they simply wanted to do something special for the community without expecting any recognition in return.